The seller has some more of them. It appears to be a PCAN-USB (IPEH-002021), but the unit has no markings or labels. I loaded the drivers from the Peak website on my Win7 laptop. When I plug in the adapter, the software recognizes it and the red LED lights. And ScooterDiag seems to connect to it, since the LED starts blinking when ScooterDiag starts up. So far I have not connected it to my bike, but I need to get a Female-Female adapter cable. The cable required is just a simple Female to Female straight cable and does not need to be terminated. Something like this female to female 9 pin serial straight lead should work fine. Thank You Alan, I built a cable as per the diagram and connected it up and presto - CAN Bus active! 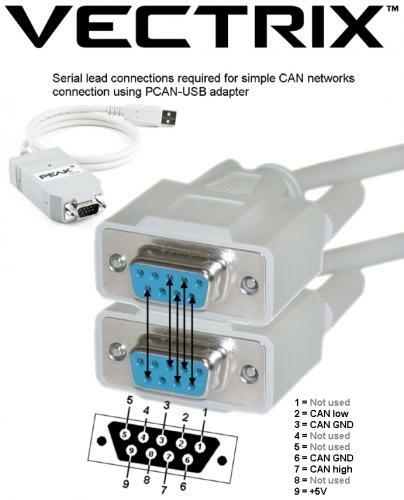 I checked the electrical continuity from the USB connector to the CAN bus connections and determined it is the non-isolated type adapter, as I suspected. Hi I'm the beginner for VX-1. Thank you for sharing the ebay link, finally got my hand on CANBUS now. But can I ask you where you get the computer software? Just can't find it or I miss looking somewhere. If you can give me a little help, I'll be very grateful.